The Lyra Influenza A+B Assay is a multiplex real-time RT-PCR assay for the qualitative detection and identification of viral nucleic acids extracted from nasal swabs and nasopharyngeal swabs specimens. The real-time influenza test has been shown to detect HIN1, H3N2 and H7N9 subtypes but does not differentiate the subtypes from Influenza A. A multiplex RT-PCR reaction is carried out under optimized conditions in a single tube generating amplicons for each of the target viruses present in the sample. Identification of influenza A occurs by the use of target specific primers and a fluorescent-labeled probe that hybridizes to a conserved region within the matrix protein gene. Identification of influenza B occurs by the use of target specific primers and fluorescent-labeled probes that hybridize to a conserved influenza B sequence within the neuraminidase gene. The Lyra Influenza A+B Assay has a one-step reagent set up. Test results are available in less than 75 minutes after extraction. 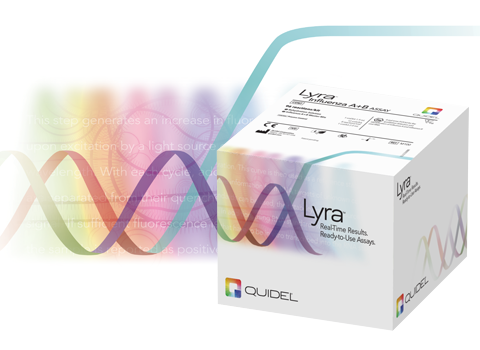 Lyra Influenza A+B RT-PCR is available for use on the Applied Biosystems® 7500 Fast Dx Real-Time PCR Instrument, QuantStudioTM Dx Real-Time PCR Instrument and Cepheid® SmartCycler® II. The Lyra Influenza A+B Assay is one in a growing menu of assays and is intended to aid in the differential diagnosis of influenza A and/or influenza B viral infections in humans.